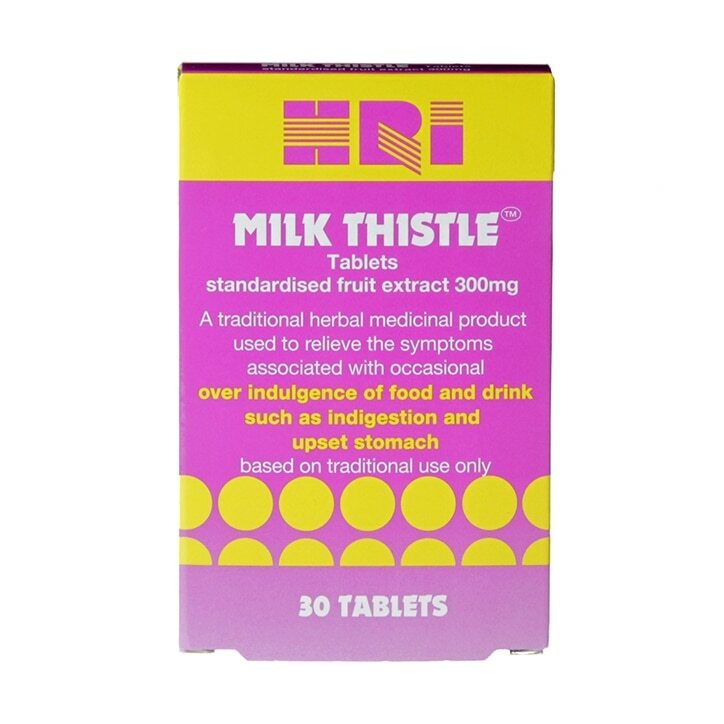 HRI Milk Thistle is a traditional herbal medicinal product used to relieve the symptoms associated with occasional over indulgence of food and drink such as indigestion and upset stomach. HRI Milk Thistle™ tablets help you enjoy the morning after a great night out. Based on traditional use only. Adults and the elderly: the recommended dosage is 1 or 2 tablets daily. The tablets must be swallowed whole with a little water. This product is not recommended for children or adolescents under 18 years of age. Active ingredients: Each tablet contains 300 mg of standardised extract from Milk Thistle fruits (Silybum marianum (L.) Gaertner) equivalent to 7200mg – 8100mg of Milk Thistle fruits, corresponding to 174 mg of silymarin, calculated as silibinin. Do not exceed the stated dose. If symptoms worsen during the use of the product or persist a doctor or a qualified healthcare practitioner should be consulted. Do not use if you are: Under 18, Pregnant or breast-feeding, Allergic to Milk Thistle or plants of the daisy (Asteraceae/Compositae) family or any other ingredients in the product. You must read the enclosed leaflet before taking this product. Keep out of the reach and sight of children. Do not store above 25°C. Store in the original packaging. HRI Milk Thistle Tablets is rated 4.2 out of 5 by 5. Rated 5 out of 5 by Jura from Excellent product. I have tried a few brands of milk thistle, but I now continually go to this brand which I find an excellent product. Not only is it very effective, but I believe is good quality for the money. Rated 5 out of 5 by Jans from Excellent quality Have been taking this brand of milk thistle tablets since the last brand I was taking became obsolete. Find this brand probably even better and always stock up when on offer, definately cant do without them. Rated 5 out of 5 by Val194 from Excellent Product. I have been taking your milk thistle for many years now and have always been more than happy with the quality and help this product has given me and would have no hesitation in recomending this product. Thankyou Holland & Barrett. Rated 1 out of 5 by Gemma3103 from Where are your usual bottles of Milk Thistle?? I have been buying the 200 capsules, 175MG Milk Thistle bottles from you for years - MUCH better value and a high Silymarin percentage...this is a complete rip off. Very disappointed.